You are here: Home / general / Happy New Year! Happy New Year everyone! We started ushering in the new year Sunday afternoon by going next door to Jim and Jean’s house for an oyster roast. Good friends Patsy and Roger also arrived at the Crossroads. 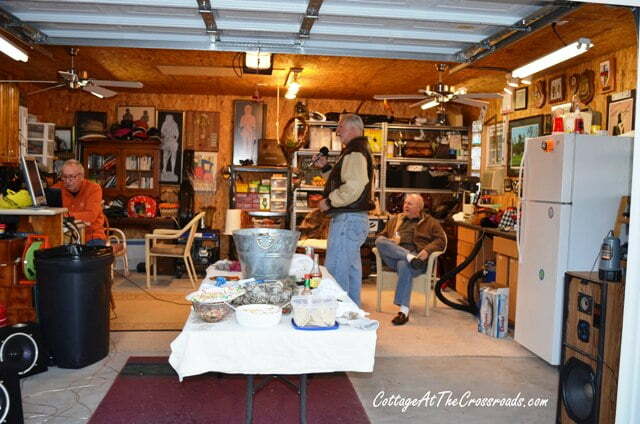 While the oysters were steaming, Jim (Leo’s brother) cranked up his karaoke system that he has in his garage and the guys entertained us by singing. 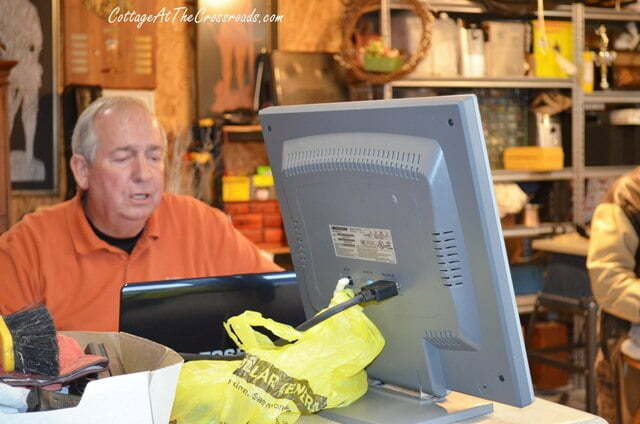 Jim is a karaoke fanatic and has just about every song known to man in his system. 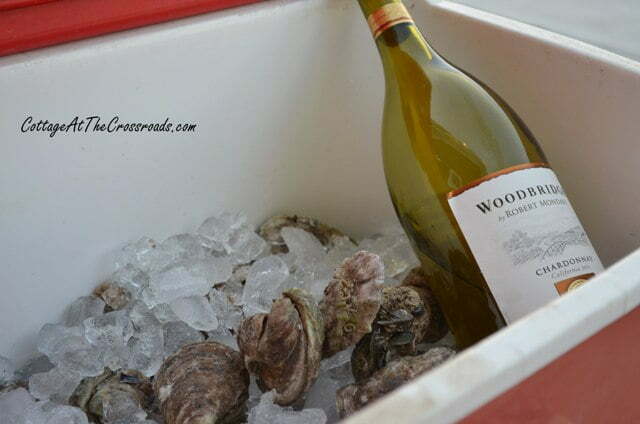 It was a really cold day in South Carolina which was perfect for an oyster roast! 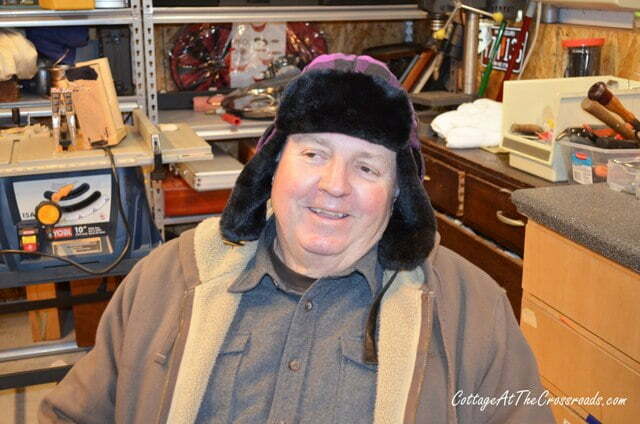 That’s why Leo has on his “Fargo” hat as I call it! We gals chimed in a little and it was a lot of fun. After we’d eaten all the oysters that we could consume, we went into Jim and Jean’s house to watch some football. We celebrated New Year’s Eve by having dinner together. Jean prepared a fabulous Lowcountry boil, and Patsy steamed some crab legs. There was even some baked salmon. It was a seafood extravaganza! Jim released some Chinese balloons late in the evening in between more football! But to tell you the truth, Leo and I were both asleep when the clock struck midnight! New Year’s Day was a pajama day for me which was a real treat! Leo made his famous collards, and we had our traditional Southern New Year’s Day foods. And we watched the University of South Carolina beat Michigan today! I hope you had a wonderful New Year’s Day. We are so blessed to have good friends, good family, and good food! And Rascal, our 12 year old cat, is blessed to have found something warm! 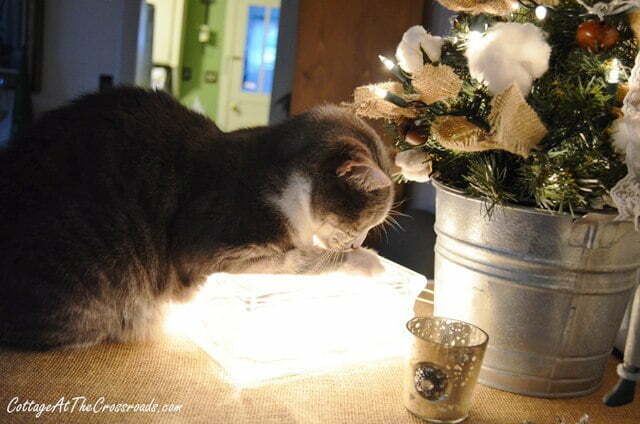 All the Christmas decorations have been put away, but I left out this glass block with lights. He drapes his body across the block and naps on it. It all started when I put out the block filled with lights as part of this vignette. Is that not the look of contentment on that face? Occasionally our other cat Henry will get on the block, but as you can see, Rascal does not like to share! He’s laid claim to his warm resting place. So I had no other option than to leave the block out for a while. What do you do special for your pets? My kitties would be fighting over that spot two. Sweet pics of your cats. I’ve got a boy & girl. Siblings. They are always changing around the current favorite spot. Sure looks like a great group of friends to have. A seafood feast would be right up my alley! 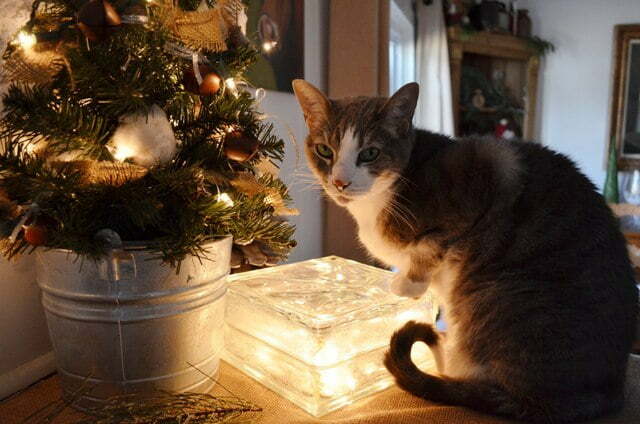 The cats on the lighted glass box is adorable! When we had our cats, I made a cozy cover for a store bought heating pad and we used that during the winter months and the cats loved it. It was affectionately known as their “Heatie”. The oyster roast looked fun! 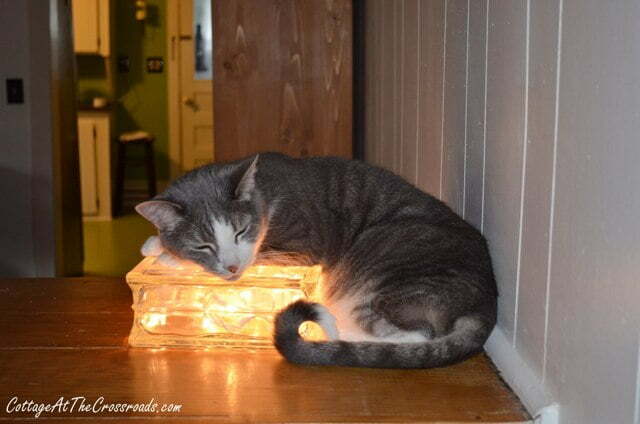 Your kitties are just too sweet with their little cozy warm spot! Happy New Year! Happy New Year Jane and Leo….Karaoke…love it! 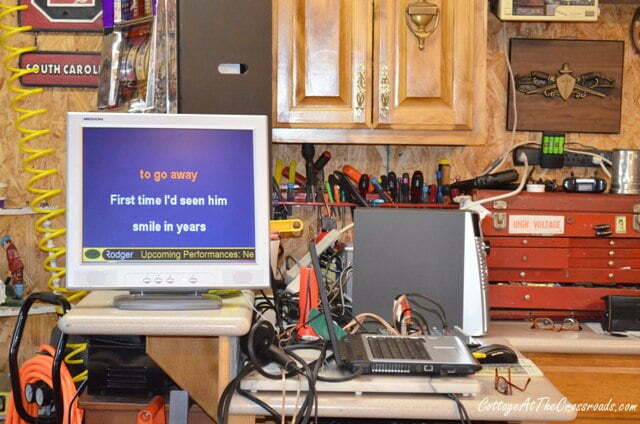 !….I can just see you all having so much fun singing the tunes! 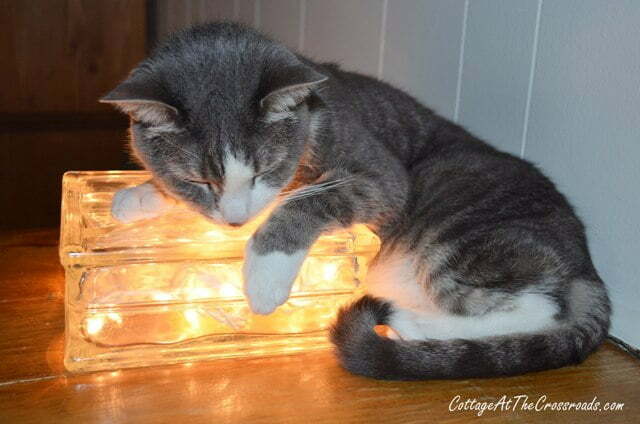 !….and love the cat and the lights…how so very adorable!!…. Our cat is 2 years old. She loves to play chase with my hubby around the house. She’ll come looking for him…she jumps on his legs to get him to chase her. It’s the cutest thing you’ve ever seen. She sleeps with us too. She’s wonderful. O how cute is that? Rascal does look content! Sounds like Henry needs his own glass block!! 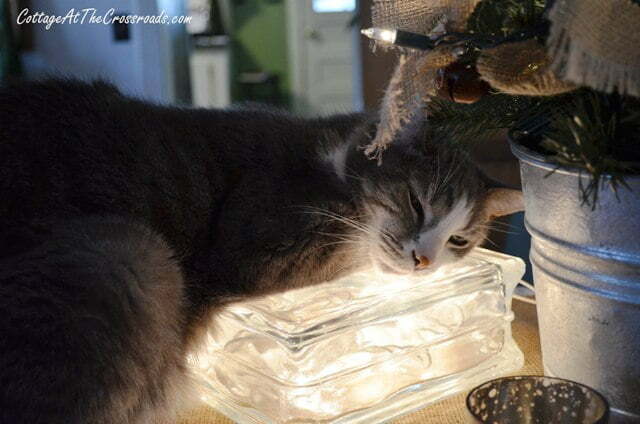 I have one, wonder if Atticus would use this warm resting place? A seafood extravaganza sounds wonderful for New Year’s Eve Jane! We cheered on the Gamecocks to victory yesterday too 🙂 LOVE your kitties draping over your Christmas block for warmth!! I’m still working on taking down our decorations in stages, the house always looks too bare after the tree comes down. Wishing you & Leo, kitties & Lucy a Happy New Year! Love the kitty getting warm, what a darling picture. 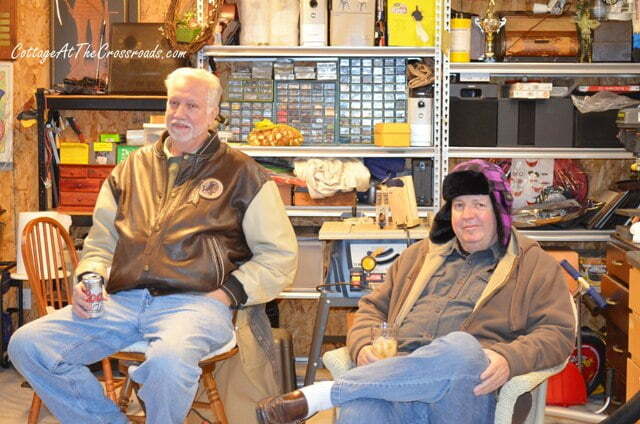 Tell Leo he is right in style with is Fargo hat all the teenage kids wear them now days. Bet you had a wonderful time singing and eating. Sounds so relaxing and fun. Oh my goodness! That is the sweetest thing I’ve ever seen…maybe our Pearl needs a glass block. Hope you and Leo have a wonderful New Year! Happy New Year Jane. Boy your celebration was far more exciting then things around here. My hubby and I fell asleep in the family room in front of the tv about 10 oclock. There’s always next year. Best wishes for a wonderful year ahead! See you at Haven( i hope). Happy New Year’s Jane! Your oyster roast and karaoke sounds like so much fun! Happy New Year, Jan and Leo. 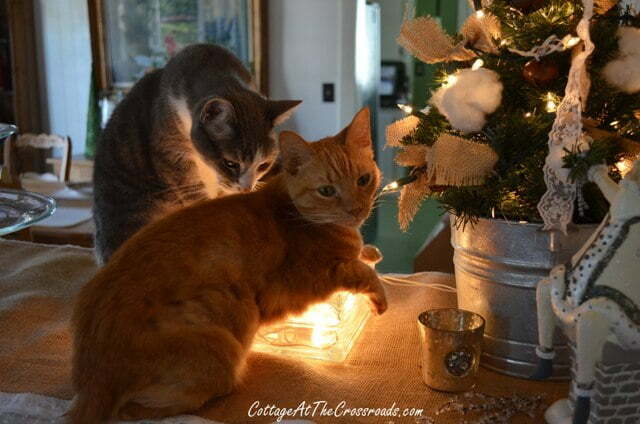 That is too funny that the kitties want to hug that light block. You should just leave it on for them so they can snuggle.